Everyone in Havre must have been stuffed with turkey this week 100 years ago because local news was scant in the December 1, 1917 issue of The Havre Plaindealer. “Elks Hold Annual Memorial Services at 3 p.m.
“The annual Memorial Exercises of the Havre Lodge of Elks will be held Sunday at the Orpheum at 3 p.m. The principal speaker will be Past Exalted Ruler E. H. Cooney of Great Falls. “Opening Ceremonies: Exalted Ruler and officers. “Male Quartette: “Still, Still With Thee.” F. W. McCarthy, Guy Funk, H. C. Tregoning, and Roy Glover. “Solo: “The Lord is My Light”, Mrs. E. J. Delahoyde. “Address: Past Exalted Ruler E. H. Cooney, Great Falls Lodge. “Closing Ceremonies: Exalted Ruler and officers. One of the great things about being a member of a multi-generational Havre family with a love and appreciation for local history are what I call the “little circles of history”, where things find their way of coming around somehow. 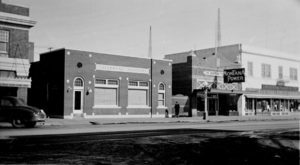 Frank W. McCarthy had been the first manager of the Havre Electric Company, which was purchased in 1912 by the Montana Power Company, who in turn built its offices and shop at 321 Second Street in 1915 and is now the current location of the Havre Elks. “Mrs. J. C. Mabee and daughter Edith spent Thanksgiving in Great Falls with Mrs. Mabee’s sister, Mrs. J. G. Noren. “Wilbur McKinnon expects to leave tomorrow for Camp Lewis, where he will enter the service. “Mr. and Mrs. T. J. Troy and family moved back to Havre this week, after having spent the summer on their homestead. “Mr. and Mrs. E. T. Richards and children of Chinook were guests on Thanksgiving day in the home of Mr. and Mrs. Sam Williams. They made the trip by auto, returning to Chinook in the late evening. Montana Power building, now home to Havre Elks BPOE 1201.